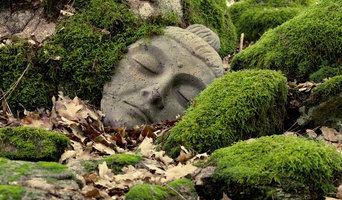 We create large scale garden sculpture in a durable fiber cement. Images of archetypal sacred antiquities. Buddhas, angels, Greek Gods. Commissions possible. PatioWow provides professional Outdoor Heating and Misting systems that allow for year around enjoyment of your outdoor living spaces. 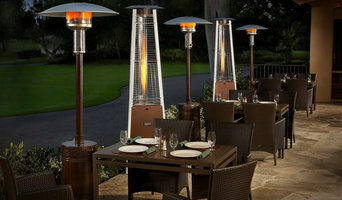 We offer outdoor gas fired infrared heaters manufactured by Detroit Radiant and Infrared Dynamics. These heaters can be used with Natural Gas or Propane Gas. PatioWow also offers electric Infrared heaters manufactured by Infratech with the broadest range of design placement capability, from recessed to post mounted. Digital timers can be used to set heating times for your heaters to ensure they go off, and are not left on. Be sure to discuss control options with the design team. At Patio Wow we offer Microcool misting systems. We design specific installation layouts that will drop the temperature on your patio 20 degrees. 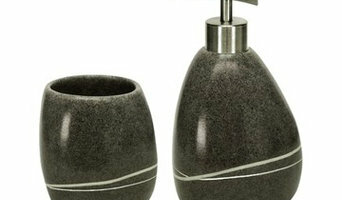 Our high-pressure nozzles in conjunction with reverse osmosis filtration allow for a no drip fine mist cooling system. Our pumps use a Variable Frequency Drive (VFD) controlled motor that eliminates the need to bypass high-pressure water, making our system much more energy efficient and longer lasting than the competitors. Our misting systems can be used in a wide variety of spaces including home patios, decks, courtyards, outdoor retail spaces, bars, restaurants and fine dining establishments. The advantage is the fact that it can help you remain focus whilst maintaining a profile you are able within your limits until you kick up high again financially. Eastwood Air provides HVAC services to both residential and commercial clients around Lodi, Stockton, Galt, Elk Grove, Lockeford, California. Customer service is our number one priority, so we offer repair services and replacement equipment at prices everyone can afford. With more than 10 years of experience in the heating and air conditioning field, our trained technicians keep prices down by recommending only the services and electrical components you need to cool your home or office. A criminal defense lawyer is a lawyer (mostly barristers) specializing in the defense of individuals and companies charged with criminal activity. What does a backyard sport court builder do? First and foremost, your California backyard court builder should have in-depth knowledge of sport rules, regulations and standards: court dimensions, net heights, lane widths and much more. If you’ll be teaching your friends, kids or others how to play, or if you plan to play on a competitive level, following national guidelines is important. Backyard court builders also keep tabs on the latest in athletics technology to provide you with the most updated options possible for your Pilot Hill, CA court. With your input, they’ll design a space that’s customized for your wish list and your home, then handle the construction. When the inevitable wear and tear starts to show, your California backyard court builder can repair, resurface or replace the aging elements. To ensure consistent quality and style, your backyard court contractor might also work closely with a Pilot Hill, CA general contractor, remodeling contractor or landscape professional. Here are some related professionals and vendors to complement the work of backyard courts: Outdoor Play Systems, Landscape Contractors, General Contractors. Narrow your search in the Professionals section of the website to Pilot Hill, CA backyard courts. You can also look through photos to find examples of Pilot Hill, CA courts that you like, then contact the contractor who worked on them.